It’s an exciting time in the American craft spirits movement. It seems like every day a new distillery pops up on the map, making serious young whiskey with an American twist. A trend among these new distilleries seems to be the use of malted barley (thus making a single-malt in the Scottish style) but aging exclusively in new charred American oak barrels, like bourbon, but for very little time (often under 2 years). Cut Spike is a prime example of the success of this approach, as are Westland and Balcones, among others. I was sent tasting samples of two single-malt American Whiskies (and a third, Hop-flavored whiskey, review upcoming!) by Jake at DPA (Thanks Jake!) from Rhode Island craft distillery Sons of Liberty. Sons of Liberty is taking the above formula and adding yet another craft twist: they’re using their experience as brewers to brew tasty beer in various styles to use as the wash for their whiskies. It makes sense, really, as beer is made primarily of malted barley and the American craft beer scene is booming even bigger than the craft whiskey one. The wash (fermented malt and water) used at most malt whisky distilleries is not something you’d want to drink: a full-dry (alcoholic without sweetness), flat, bland, warm, beer-like liquid with dead yeast cells floating in it. Also, since most whisky is made from the same strain of distiller’s yeast, and the same high-yield strain of barley, this wash would also be largely the same at each malt distillery. Instead, Sons of Liberty is brewing tasty stouts and belgian-style beers to distill into their equally tasty malt whiskies. To prove it, Jake included a 12 oz bottle of the wash (slightly carbonated) from each of their two main whiskies! 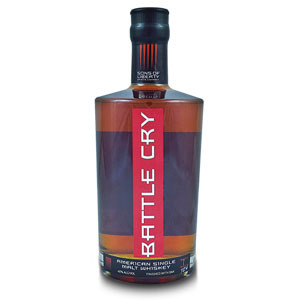 Battle Cry is an American single malt whiskey distilled from a Belgian Trappist-style beer (using Trappist Yeast) made with 20% rye malt and the rest Pale and Honey malts. The beer is then double-distilled in Sons of Liberty’s 250 gallon pot still and aged for under two years in new charred American oak barrels that are “enhanced” with lightly toasted staves of French Oak (something they probably learned from Compass Box’s John Glaser). They use both 10 and 30 gallon barrels, probably to accelerate the oak influence (smaller barrels transfer oaky flavors more quickly than larger ones). The whiskey is then bottled at 40% ABV without chill filtration or added coloring. My 375ml tasting bottle was bottle #840 from batch #8. Nose: Honey-sweet, with milk chocolate, oatmeal cookies, and heavy oaky vanilla. There are bourbon-like charcoal notes, but the balance is between malty cereal notes (like a Speyside single malt) and big oak-derived aromas. 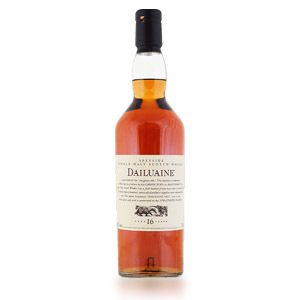 Palate: Heavy bodied, with a few nutty flavors (toasted almonds) and more malty grains. Some marshmallow, and a heavy dose of oaky tannins. A bit of clove. Very bourbon-like. Finish: Medium-long. Candy-corn (honey), toasted oats, stale spices (clove, nutmeg), fading with marshmallow and a dark cacao nibs. With Water: A few drops of water wake up some vegetal notes – menthol or eucalyptus primarily – making this suddenly smell like a young straight rye. The palate is a little thinner, but the finish is more lively and almost has a bare hint of tropical fruit (green banana). A little water’s not a bad idea with this one. Overall: This drinks like liquid oatmeal cookies. A nice balance of clear-cut cereal grains with (almost) heavy-handed new oak. 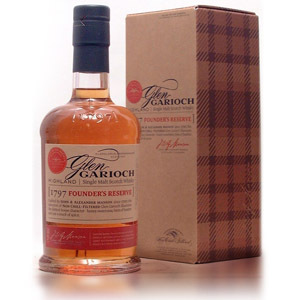 Like most American single-malts, this is more like bourbon than scotch, certainly because of the use of new charred oak. That said, this one stands out in the crowd due to its spot-on cereal notes, which could be because of the attention paid to the wort/wash. Currently, Sons of Liberty products are only available in the US Northeast. Here’s hoping their distribution becomes wider! It’s not often, short of a distillery tour, that you get to taste a whiskey’s wash alongside the distilled and aged final product. I’ve certainly never been able to do it. Battle Cry’s wash is lightly carbonated (a courtesy, since the actual fermented wort would be flat), and is heavy with Trappist yeast notes of sour grapes, citrus peels, and honey. The beer is thicker and heavier than I anticipated, but it is yeasty in that Belgian style. Interesting that the yeast-specific fruit notes do not make it into the whiskey, whereas the 20% malted rye is undetectable in the beer, but very influential in the whiskey! I enjoyed the beer so much that I savored the rest of it while watching a movie. I am SO curious what a boilermaker with Battle Cry wort and a shot of Battle Cry whiskey would taste like… Also check my review of Uprising from Sons of Liberty: a single-malt American whisky made from stout! You mention Westland and Balcones. How about doing reviews of some of their whiskies? In fact, I would like to see you do a LOT more reviews of whiskies from American craft distilleries. You have covered the mainstream Scottish, Irish, and American whiskies. I know you don’t have much access to Canadian whiskies (at least the stuff that isn’t terrible and that we keep to ourselves in Canada). American craft distilleries really are the new frontier, and since you appear to be in California you can get a lot of obscure whiskies shipped to you. 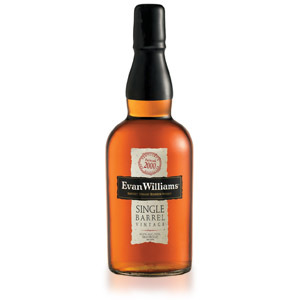 You have reviewed a few American malts now, so you have at least ventured beyond the bourbons and ryes, but I don’t believe you have reviewed a single wheat whiskey yet (not even the ubiquitous Bernheim), or a corn whiskey. What about a “rye malt” whiskey? (I for one want to see someone compare such a rare animal to the regular un-malted ryes). High West has an oat whiskey. A distillery in Milwaukee, Old Sugar, has a sorghum whiskey. Koval in Chicago makes millet whiskey and oat whiskey too. Corsair seems to be making one crazy whiskey after another. These are the whiskies that I would like to see you cover, as well as the more traditional war horses. Hi moretears, thanks for the suggestions! I have a bottle of the new Sherry Cask Westland that I’ll be opening to review soon. As for the others, there’s a lot of whisky out there, and I only manage to find time for one review a week. As I end up saying a lot: So many whiskies, so little time! Hopefully I’ll be able to cover more American single malts and other American craft whiskies as they become more widely available. Cheers!